The ASKER Durometer TypeC2 for soft rubber, sponges, and other foam elastomers, as well asrolled-threads (yarn packages), etc. 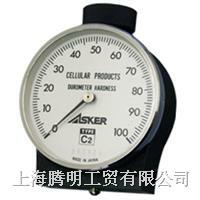 It is suitable for softmaterials difficult to measure using the ASKER TypeC. The Pressure foot in contact with thespecimen is 44mm in width and 18mm in depth, wide enough to ensureaccurate measurement. The Longer Pressure Foot Type (C2L type)is applicable for measurement of narrow or concavespecimens. 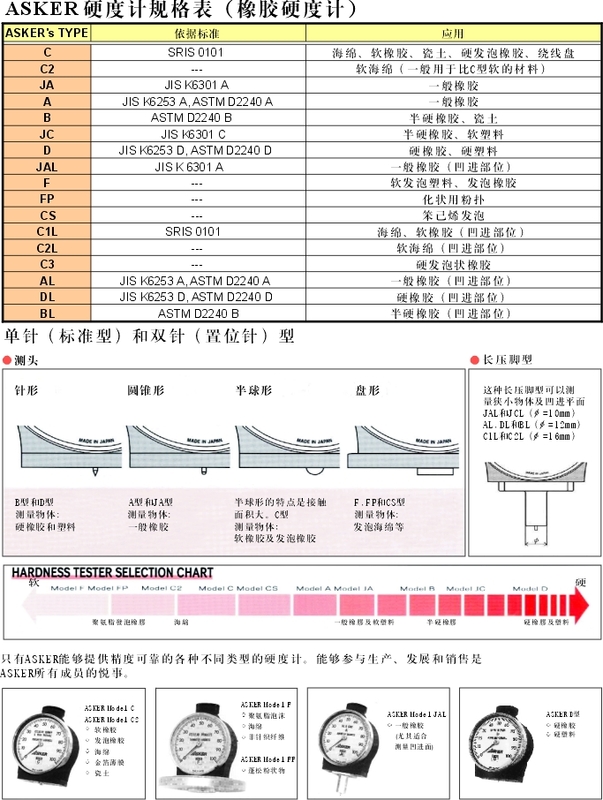 Type A Durometer (ASKER A type), conforming to JIS K 6235 is themost popular type of durometer for measuring rubber hardness. However, verification is recommended because a significantdifference is estimated to be the largest when a durometerindicates measurement values from 10 to 90 points. 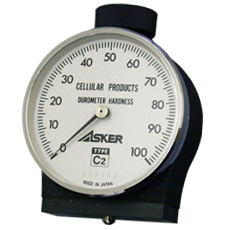 For hard specimens for which Type A Durometer readings indicatemore than 90 points, measurements should be undertaken using theType D Durometer (ASKER D type). However, for soft specimens withmeasurements of less than 20 points, the ASKER C type or Type EDurometer (ASKER E type) should be used. The most importantconsideration in using durometers is to select the correct type forpurposes of measurement according to the specimen. A custom designed pressure foot durometer is availableaccording to specimen conditions. The stationary set hand (max-hand) makes the maximum value easierto read and allows the creep characteristics of a specimen. Accurate measurement is made possible for specimens* for whichstress relaxation occurs over time or for specimens for which it isdifficult to take readings from the front. *Materials for which the reading decreases immediately after theindentor has been pressed against the surface. · Constant loarder assures uniform test pressure eliminatingfalse readings due to differences between operators in measuring byhand. · High accuracy and repeatability of the hardness readings areassured by the flexible joint function. · The gauge to check the indentor height on a durometer and thereading indicator mechanism.